Jackson’s stock a wide variety of manual and electric pencil sharpeners. 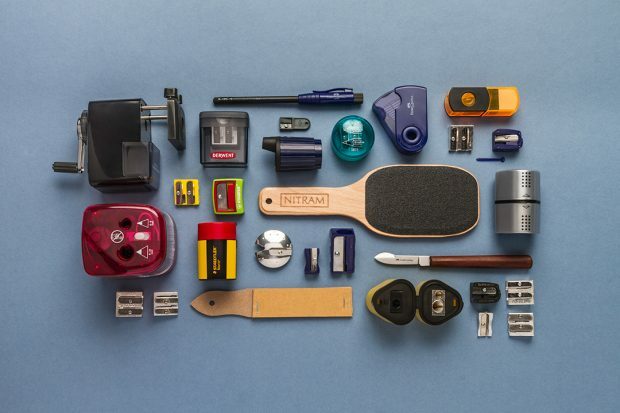 This post compares all of the sharpeners we sell, from humble single-hole sharpeners to precision electric models, giving a fair account of their different strengths and weaknesses. Blade vs Helix Sharpeners, where I explain the difference between the two types of pencil sharpener. Simple Sharpeners, where I compare all of our blade sharpeners which do not have built-in reservoirs to catch the shavings and graphite dust. Reservoir Sharpeners, where I compare all of our blade sharpeners which have reservoirs to catch the wood shavings and the graphite dust. Helical Sharpeners, where I compare our heavy-duty desktop crank sharpeners. 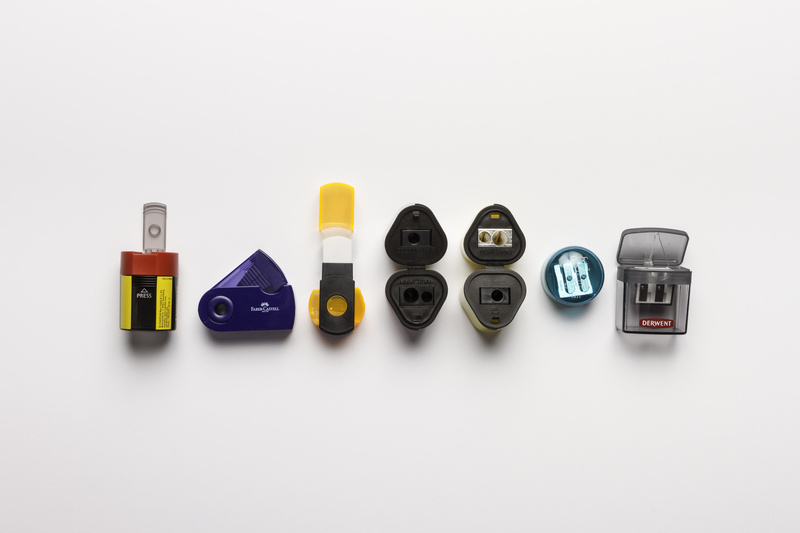 Electric Pencil Sharpeners, where I compare our mains- or battery-powered electric pencil sharpeners. Miscellaneous Sharpeners, where I look into our sharpening blocks, knives and so on. These tools are mostly designed for use not with pencils, but with other drawing tools such as graphite or charcoal sticks, pastels, and crayons. They can however be used to sharpen pencils into unorthodox shapes, which isn’t possible with most manual or electric pencil sharpeners. Leaving aside for the moment sandpaper, sharpening blocks and knives, which are used to sharpen charcoals, graphite sticks and the like, there are two main types of pencil sharpener: Blade Sharpeners and Helical Sharpeners. What is a Blade Sharpener? Blade sharpeners are the more familiar of the two. These are the pencil sharpeners we all used at school. You simply push the end of the pencil into a conical chamber and twist. The pressure forces the end of the pencil into contact with the blade, which remains stationary. As the pencil rotates, the blade pares away the wooden casing of the pencil and sharpens the lead. 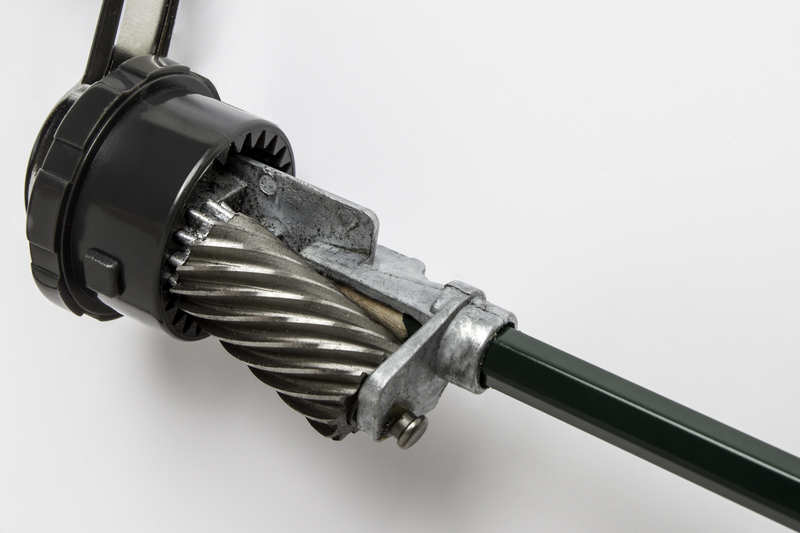 What is a Helical/Crank Sharpener? Helical sharpeners are slightly more complicated than blade sharpeners. With a helical sharpener, it’s the cutting apparatus that revolves, not the pencil; the pencil remains stationary, clamped in place. Instead of a blade, they have a cylinder which bears a spiralling series of sharp ridges along its length. This cylinder is mounted on a cog, which causes it to rotate as it circles the pencil. The sharp ridges grind against the pencil, shaving away the wood and sharpening the lead to a fine point. 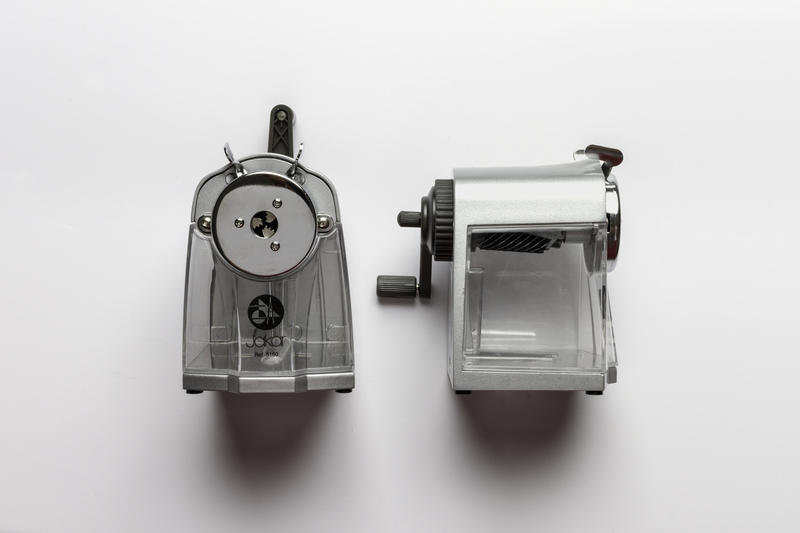 A photo showing a Faber Castell 9000 HB pencil and the helical sharpening apparatus from the Caran d’Ache Plastic Desktop Crank Pencil Sharpener. 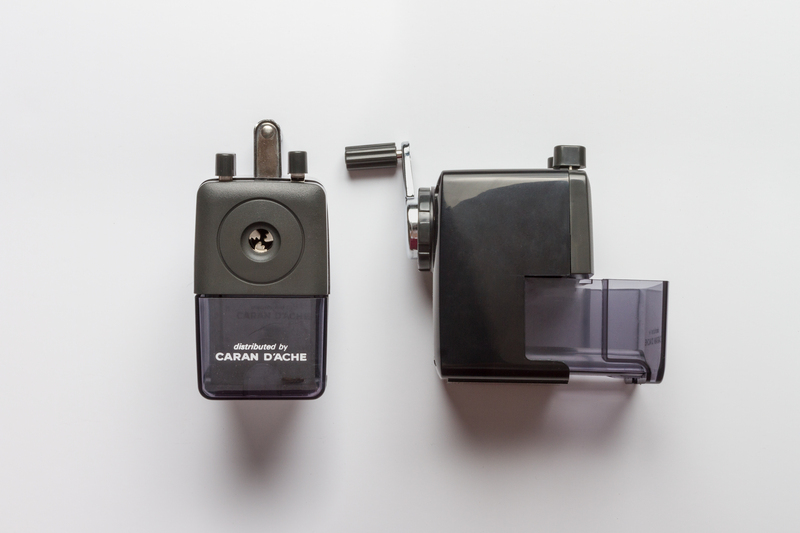 A close-up of the sharpening apparatus from the Caran d’Ache Plastic Desktop Crank Pencil Sharpener. 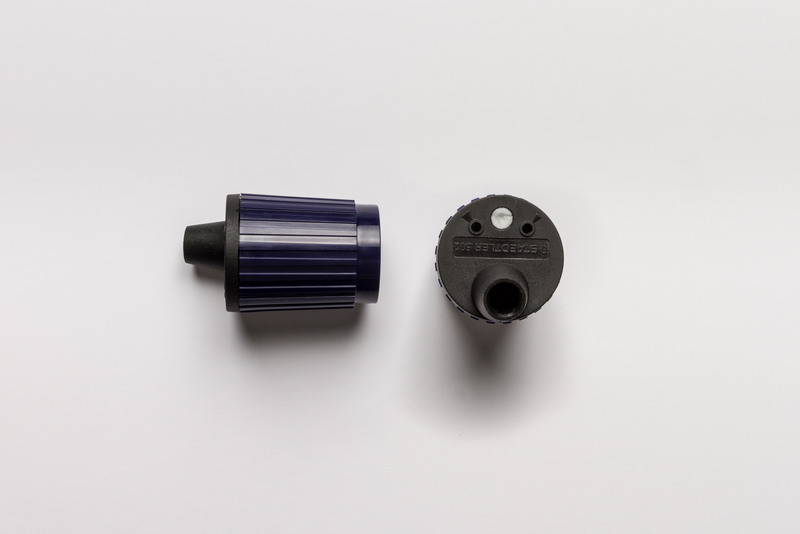 When the handle is turned the metal cog travels around the geared plastic housing, causing the sharpening cylinder to spin. Back to Top of Article. This is the simplest and cheapest pencil sharpener we sell. 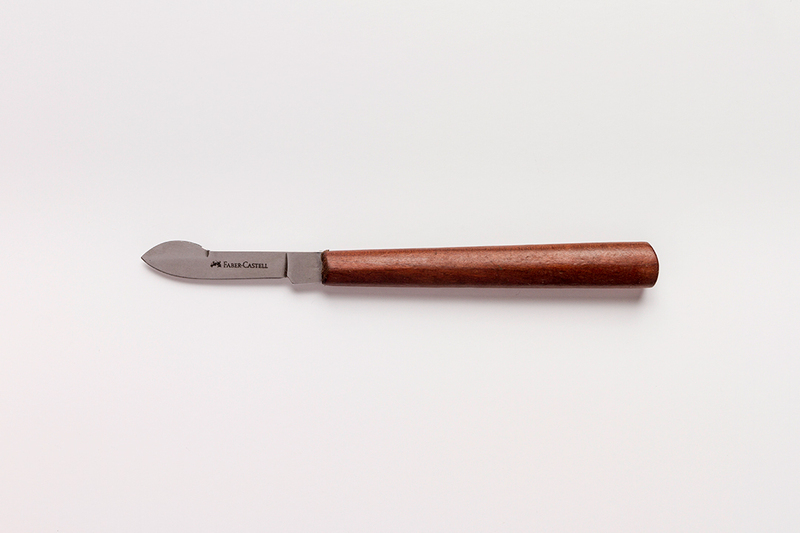 It is small, tough and portable, though it will only sharpen standard diameter (e.g. 7mm) pencils. 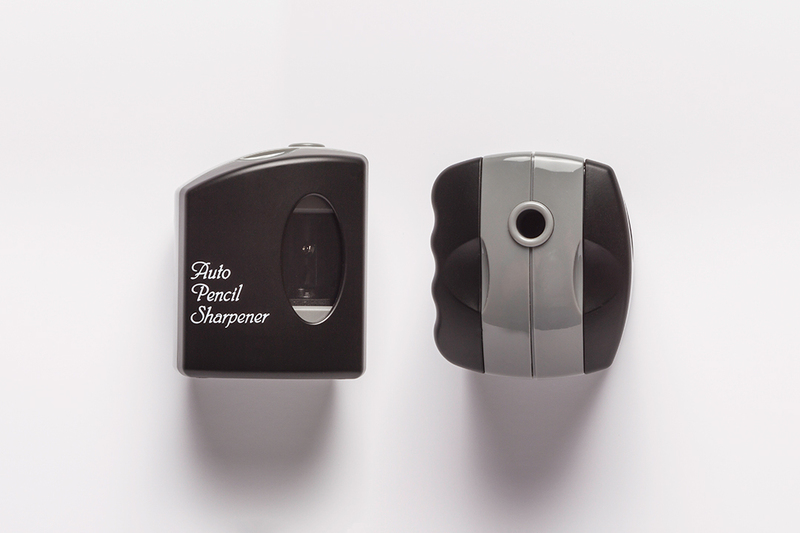 This double sharpener is small, tough and portable. 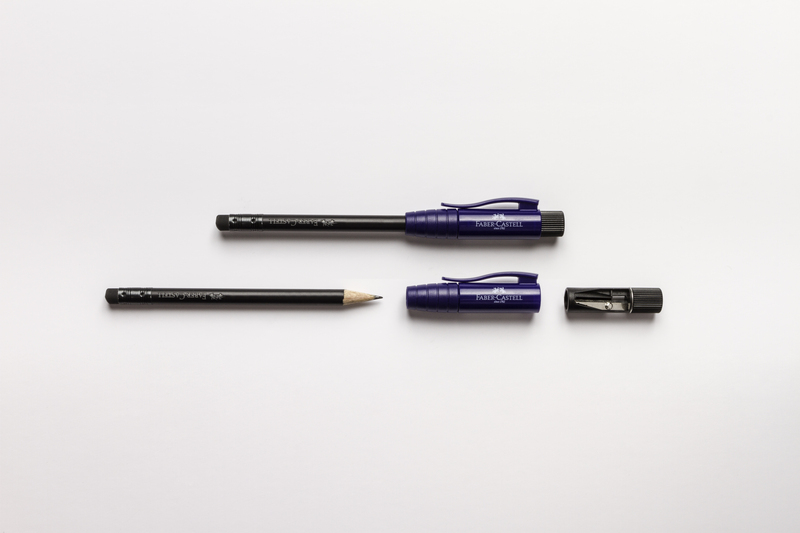 It has two sharpening holes: one for standard diameter pencils (7mm) and one for large (11mm) pencils. For the money, I think it’s the best sharpener we sell. This Caran d’Ache pencil sharpener is made of metal and has two steel blades. It is designed for use with Caran d’Ache Technalo and Grafwood pencils, but will fit any 7mm and 9mm pencils. It performed pretty well in the test we conducted. 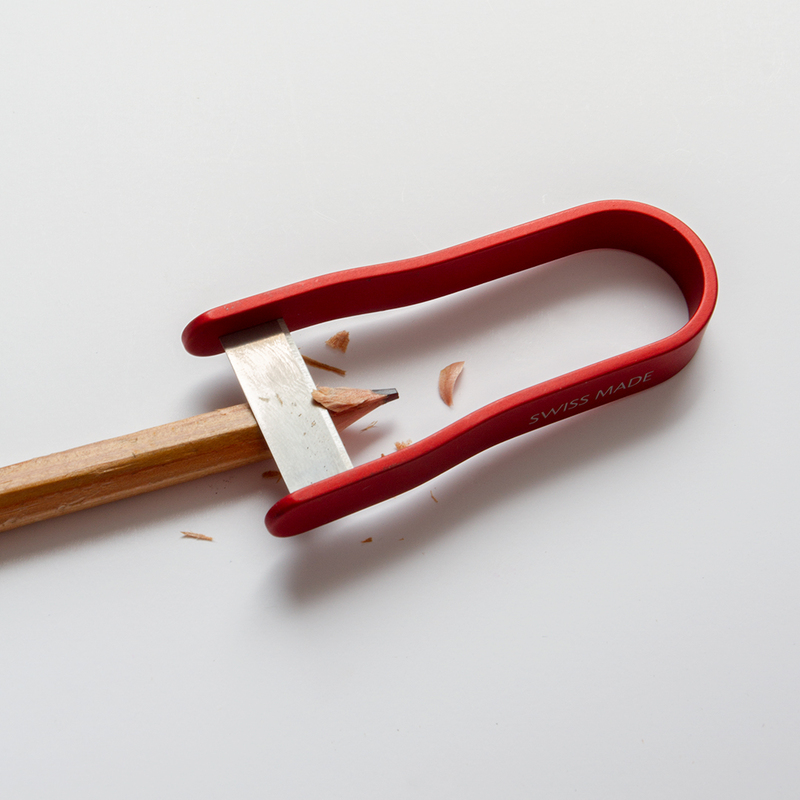 This sharpener is small, economical and portable. 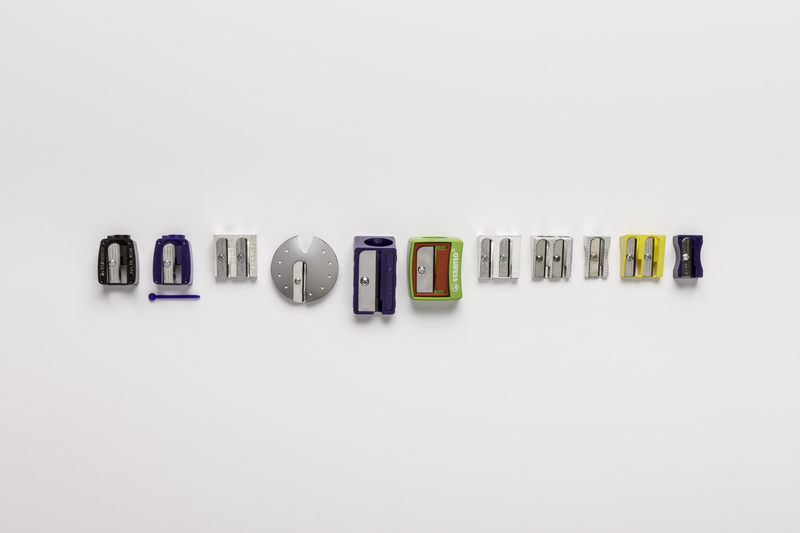 Like many of the plastic pencil sharpeners we sell, the colour of the item might vary. 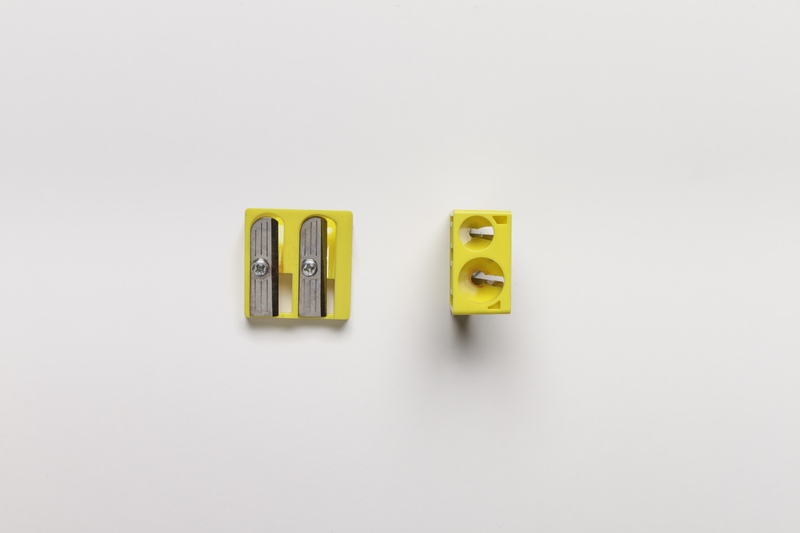 This double-hole sharpener is suitable for use with 7mm and 9mm pencils. It is light and very economical. This sharpener is designed for use with Stabilo Carbothello Pastel Pencils, which have softer leads than regular graphite pencils and cannot hold as fine a point. They therefore have to be sharpened to a slightly wider angle (i.e. a stubbier point). This quality plastic sharpener has a single hole that fits 7mm diameter pencils. It sharpens pencils to stubby tips and is therefore suitable for use with pastel pencils, which have soft leads. It is basically the same as the Stabilo Carbothello Pastel Pencil Sharpener, but it has a special feature; a small plastic rod which can (in theory) be used to fish bits of lead out of the sharpening assembly. (If you look at the shape of the sharpener, it’s not really possible for pieces of lead to get stuck in it, but you never know when a small plastic rod might come in handy). This sharpener is designed for use with ‘Jumbo’ 12mm diameter pencils such as the Faber Castell Series 9000 Jumbo or the Koh-I-Noor Jumbo Graphite Pencil 1820. The colour of the plastic portion of the unit might vary from that shown above. This sharpener is designed for use with Stabilo Woody Three-In-One Pencils. It doesn’t seem to work well with any other pencil. 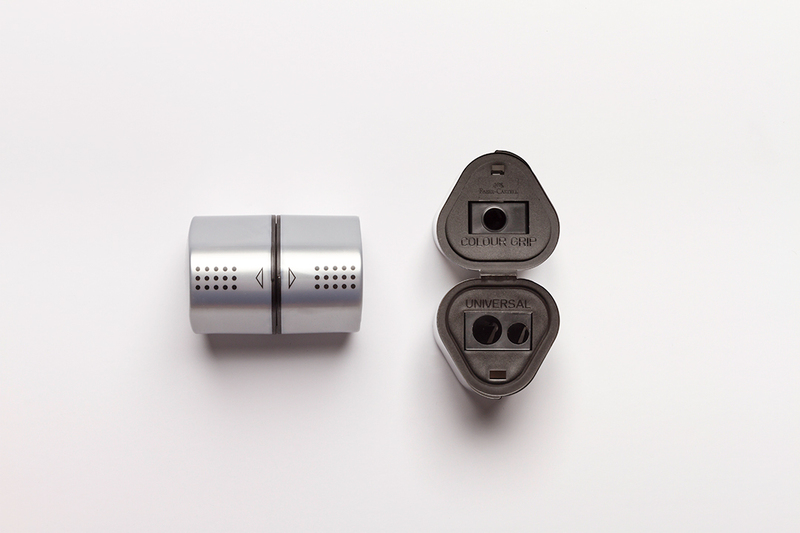 This Faber-Castell pencil sharpener is made of steel and will keep its point. 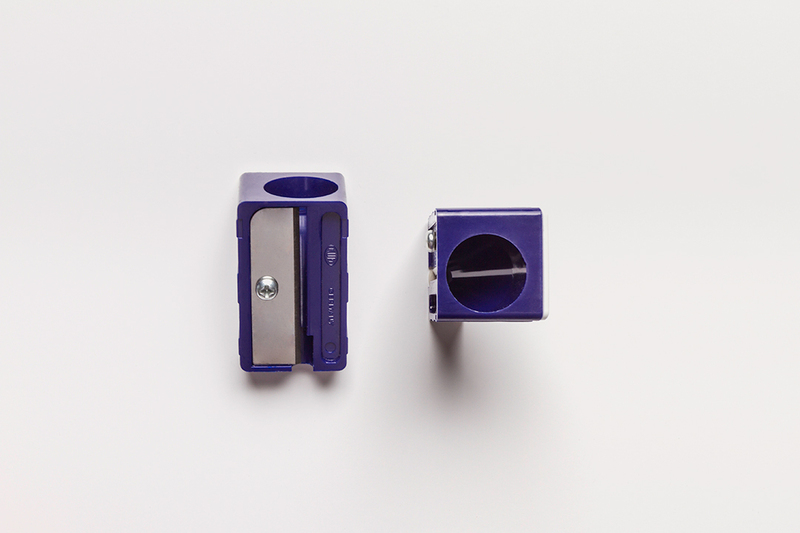 It is a double hole sharpener which can sharpen standard diameter graphite and colour pencils. We tested our reservoir sharpeners on a range of pencils, from the large (a Koh-I-Noor Jumbo Graphite Pencil and a Faber Castell Series 9000 Jumbo Pencil) to the small (a Cretacolor Karmina Coloured Pencil and a Staedtler Tradition Sketching Pencil). We also used a couple of pencils which are difficult to sharpen, because they have flaky or crumbly leads; a Conte a Paris Charcoal Pencil and a Stabilo Carbothello Pastel Pencil. In the following table, an ‘X’ entry indicates that a pencil and sharpener are incompatible. Either the pencil won’t fit, or the sharpener will only chew it and break the lead off. The star performer was probably the JAS : Double Pencil Sharpener. I also liked the Caran d’Ache Double Metal Pencil Sharpener for Grafwood and Technalo Pencils. 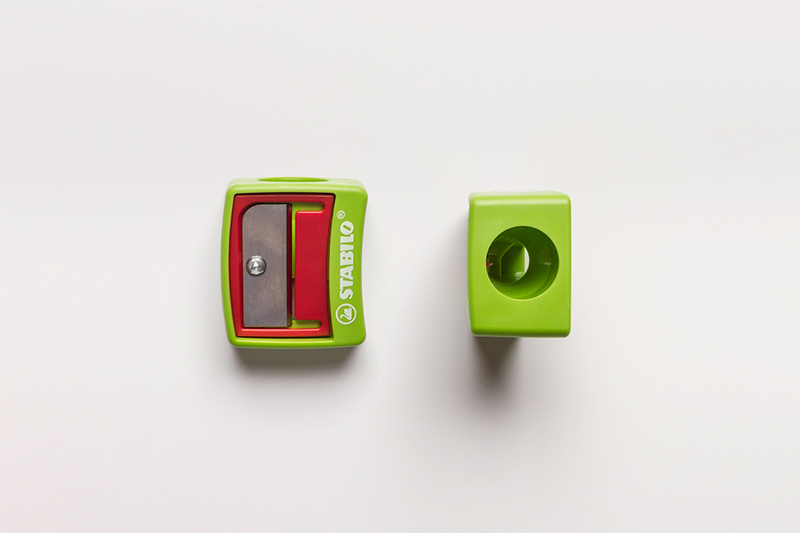 Stabilo : Woody 3-in-1 : Sharpener Only used for Stabilo : Woody 3-in-1 Pencils. Only used for Stabilo : Woody 3-in-1 Pencils. Only used for Stabilo : Woody 3-in-1 Pencils. Only used for Stabilo : Woody 3-in-1 Pencils. Only used for Stabilo : Woody 3-in-1 Pencils. Only used for Stabilo : Woody 3-in-1 Pencils. What is a Reservoir Sharpener? 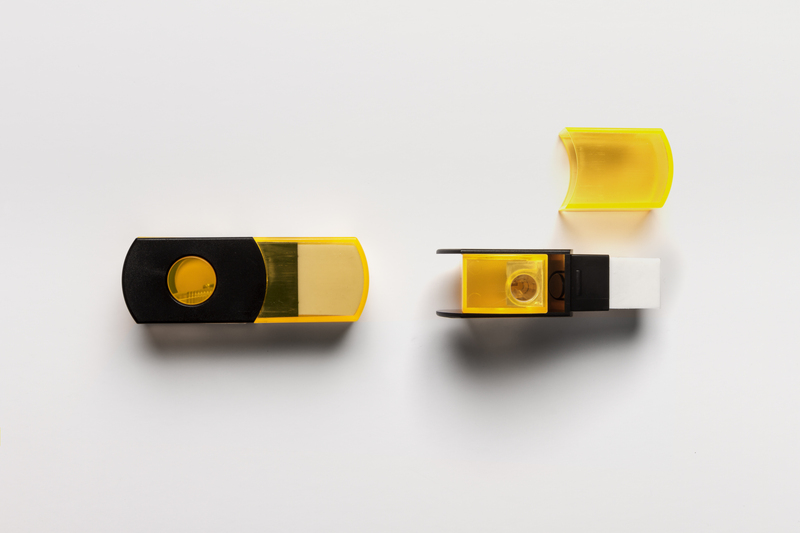 This innovative and portable Jakar sharpener combines a reservoir sharpener with an eraser, which has a plastic cap to keep it clean. It is suitable for use with standard diameter pencils. 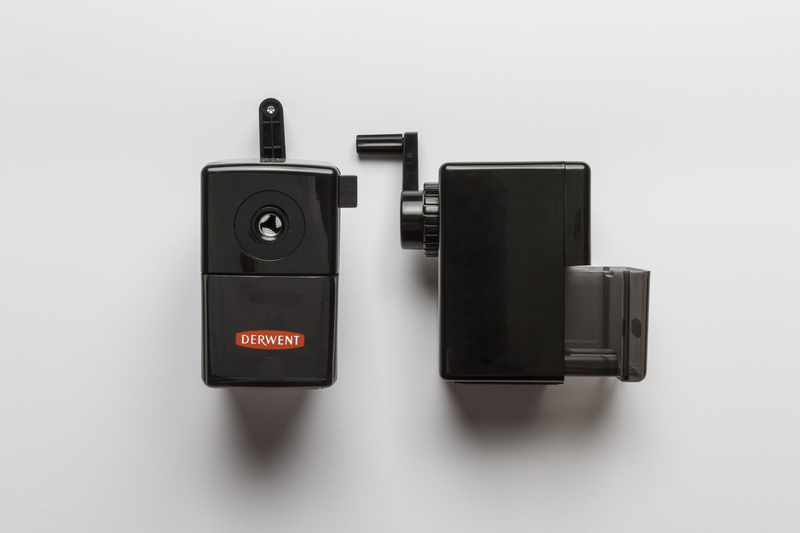 The sharpener revolves: it can be turned inwards so that it does not leak graphite dust through the blade aperture. To empty the pencil shavings from the (very small) reservoir, simply swing the sharpener outwards and pull it off the main unit. 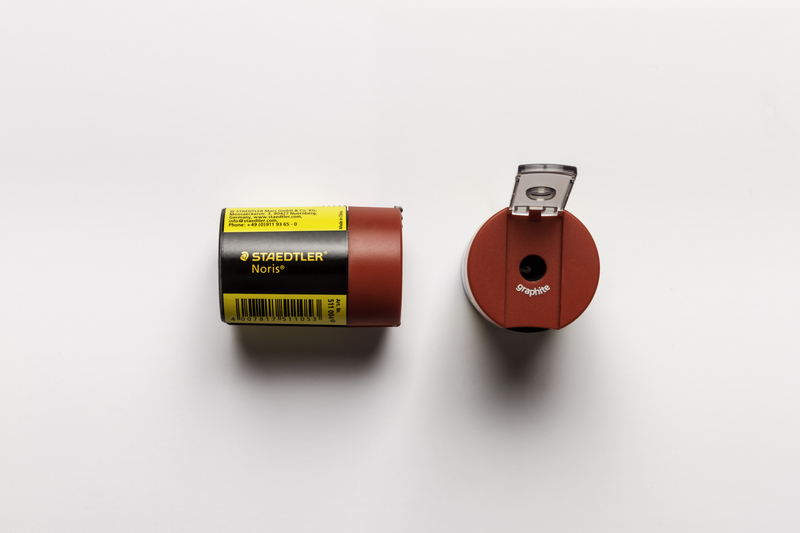 This Staedtler Pencil Sharpener is designed for use with regular graphite pencils. 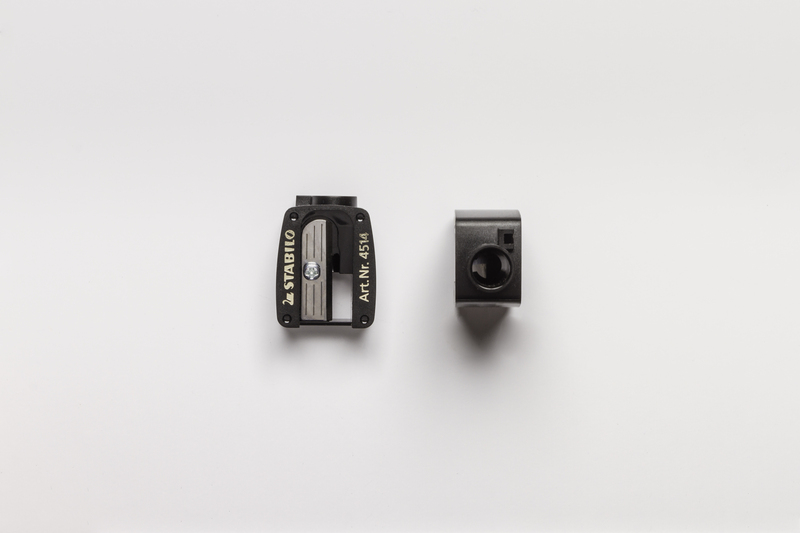 It is a single-hole sharpener with a reservoir for graphite and wood shavings and a cap to stop dust leaking from the sharpening hole when not in use. Once the reservoir is full, simply press the button on the side to release the lid then empty the sharpener into a bin. It’s made of plastic, but this sharpener has an air of solid dependability about it. 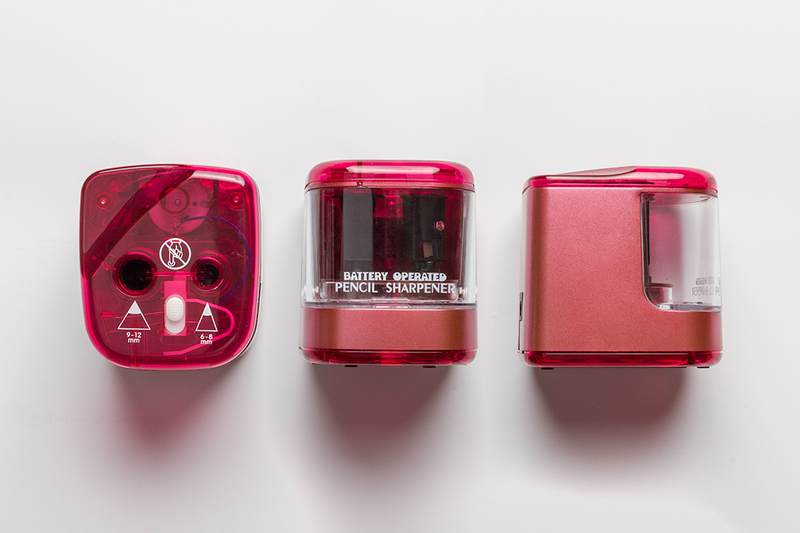 This Jakar Trio 3 Way Pencil Sharpener is made from strong yet lightweight plastic. It features three holes: one for sharpening coloured pencils, one for regular-sized graphite pencils and one for jumbo pencils. It proved to be the most versatile of all of the reservoir sharpeners Jackson’s sell, and it is also highly portable. When it is clipped together, it is shaped like a triangular prism with blunted corners. It can be slipped into a bag or a pocket without fear of it coming apart or shedding dust everywhere. This Faber Castell Easy Grip Trio Sharpening Box is made from strong yet lightweight plastic. It features three holes: one for sharpening coloured pencils, one for regular-sized graphite pencils and one for jumbo pencils. It did well in our tests and is very portable. 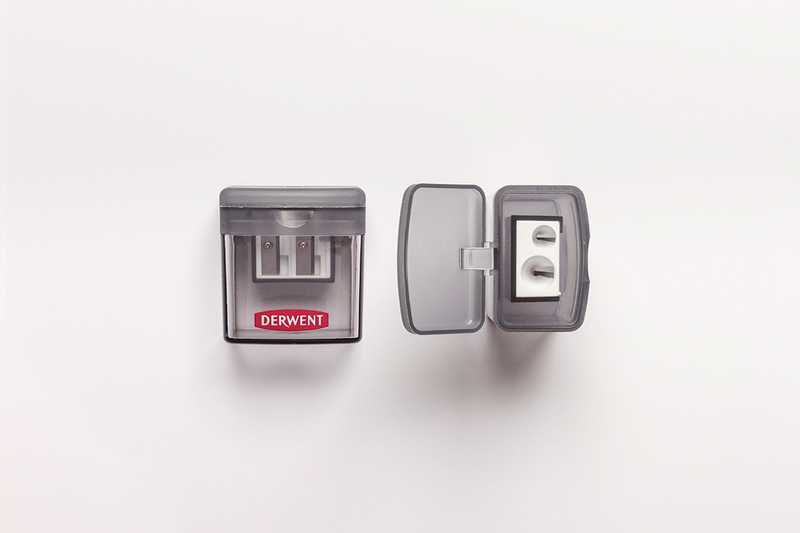 This Derwent Twin Sharpener can be used to sharpen pencils of 7mm and 8mm diameters. It has a lid to stop lead dust falling out of the sharpening hole, and a larger reservoir than most sharpeners. 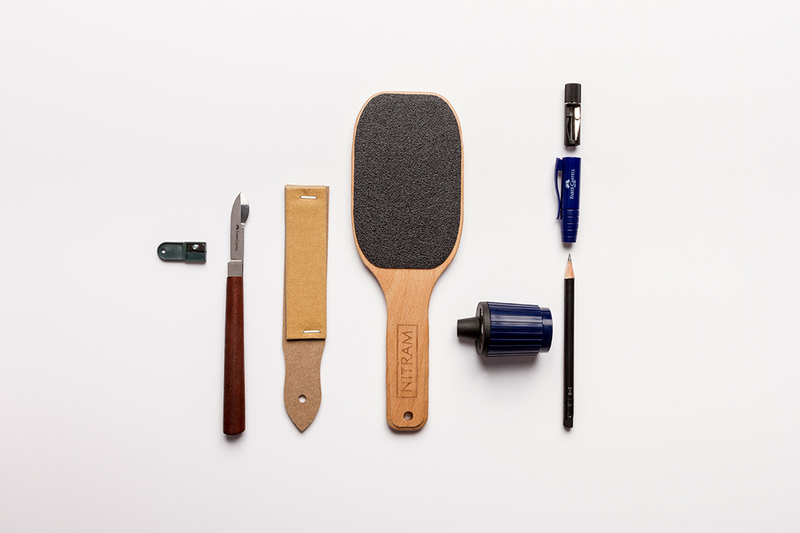 It would therefore be perfect for longer sketching trips or for those who sharpen their pencils very regularly. This Faber Castell 9000 sharpener has two sharpening holes and is suitable for coloured pencils and graphite pencils. It has a compartment which will catch the shavings from wood-clad pencils. When not in use, the sharpening apparatus will slide down into a plastic case so that graphite dust cannot fall out of the sharpening holes. We used the same selection of pencils to test our reservoir pencil sharpeners: a Koh-I-Noor Jumbo Graphite Pencil, a Faber Castell Series 9000 Jumbo Pencil, a Conte a Paris Charcoal Pencil, a Stabilo Carbothello Pastel Pencil, a Cretacolor Karmina Coloured Pencil and a Staedtler Tradition Sketching Pencil. In the following table, an ‘X’ entry indicates that a pencil and sharpener are incompatible. Either the pencil won’t fit, or the sharpener will only chew it and break the lead off. 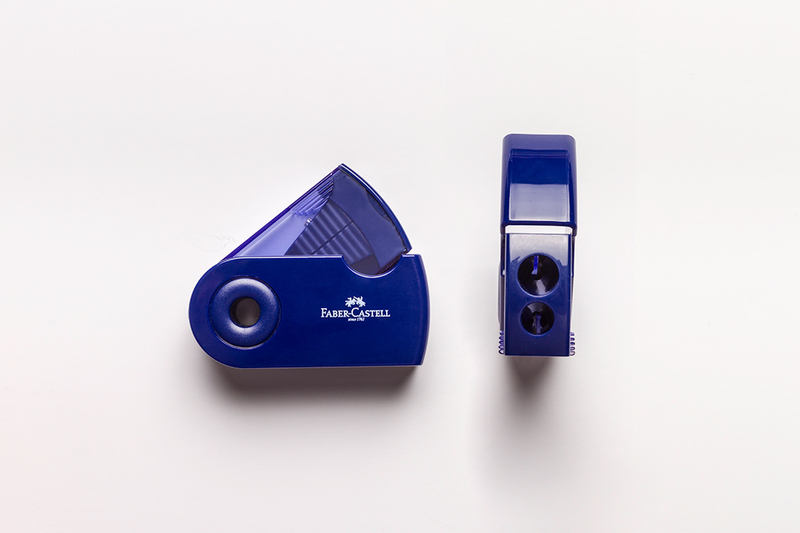 The most versatile was the Jakar Trio 3 Way Pencil Sharpener, which sharpened all of the pencils nicely. The other sharpener which shared the same design, the Faber Castell Easy Grip Trio Sharpening Box, was also very effective on pencils of different sizes. What is a Helical pencil sharpener? Helical pencil sharpeners are also known as ‘crank sharpeners’. 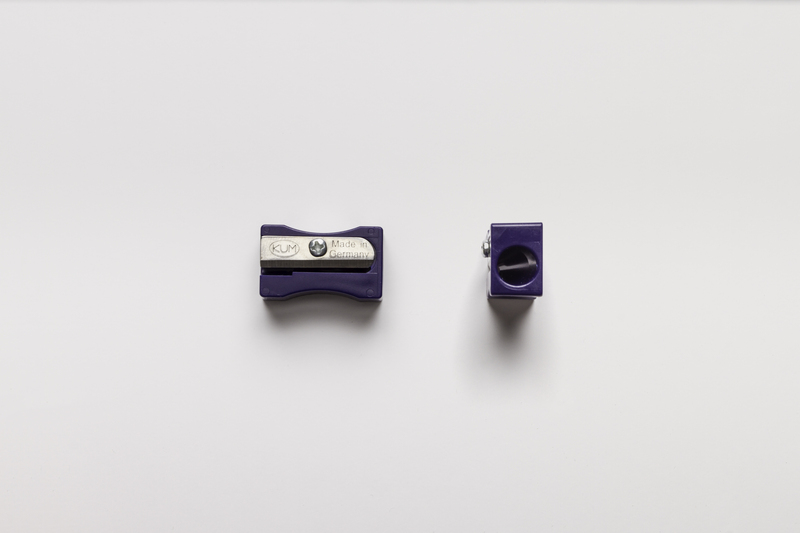 With helical pencil sharpeners, the pencil remains clamped in place, while the sharpening mechanism revolves around it. Instead of a blade, they have a cylinder which bears a spiralling series of sharp ridges along its length. This cylinder is mounted on a cog, which causes it to rotate as it circles the pencil. The ridges grind against the pencil, shaving away the wood and sharpening the lead to a fine point. This Caran d’Ache crank sharpener is small and elegant. It’s not the cheapest of the crank sharpeners, nor the most versatile, since it can only sharpen regular 7mm pencils, but it looks good and feels sturdy and well-made. It comes with a small clamp to attach it to a tabletop. 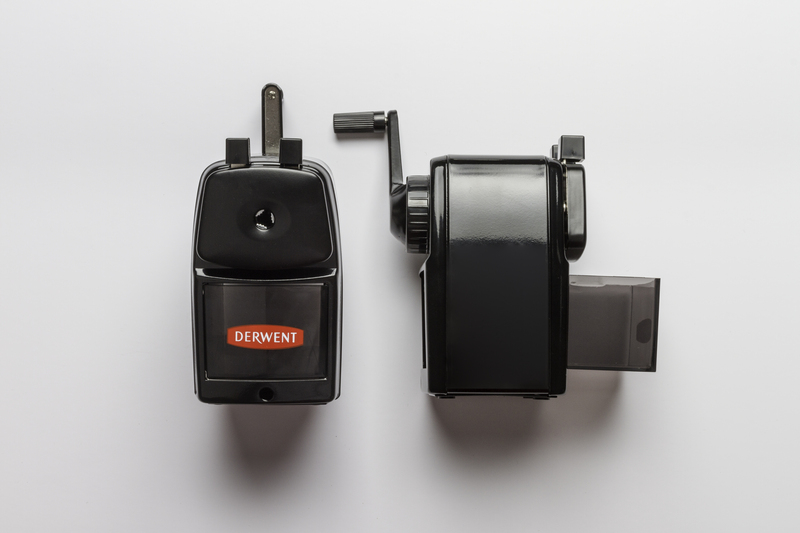 The sharpening mechanism in this Derwent crank sharpener is basically the same as that in the Caran d’Ache plastic model, though the chuck releases with a button rather than a set of handles which you pinch. The Derwent model is slightly larger (with a slightly larger chamber for shavings and dust) but it feels a little more rattly and fragile. It can sharpen pencils with a diameter between 7 and 9mm. This Derwent sharpener is basically a slightly larger version of the plastic Derwent model above, with a heavy metal body and a pinch-style chuck. Again, it can sharpen pencils of between 7 and 9mm diameter. It still feels rattly. The chamber, chuck and crank are all plastic, and it feels as if they don’t quite fit the metal body. The chamber for shavings is large. It does come with a clamp to fix it to a table, but the whole unit is so heavy this feels a bit redundant. Uniquely among the crank sharpeners, this bulky Jakar model can sharpen pencils of between 7 – 11.6mm diameter to a variable tip. 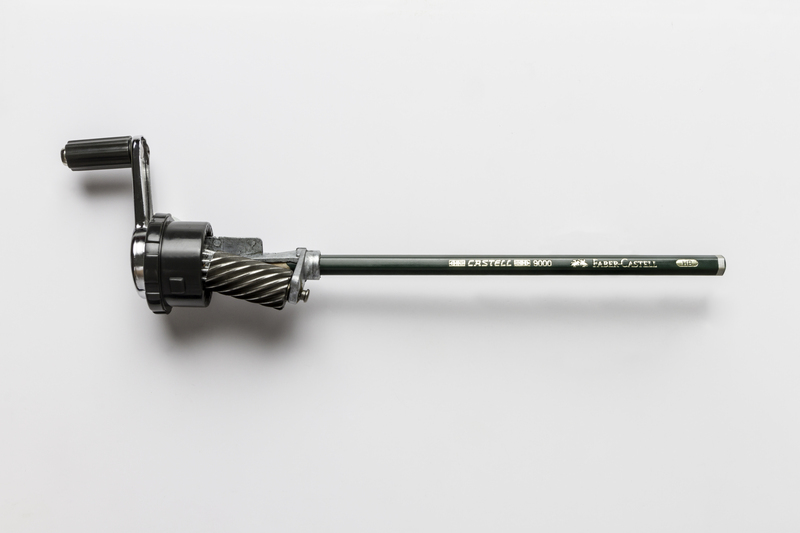 On the crank handle, there’s a small nut which can be turned clockwise or anti-clockwise; this changes the angle at which the helical screw meets the tip of the pencil. Thanks to this feature, this sharpener can be used with both graphite pencils and softer pencils such as coloured pencils, large coloured pencils or pastel pencils. The chamber is large and transparent, and it’s possible to watch the sharpening mechanism revolving around the pencil, which is quite satisfying. It comes with a clamp, but it’s heavy enough without one. For this test we used the same selection of pencils as above. 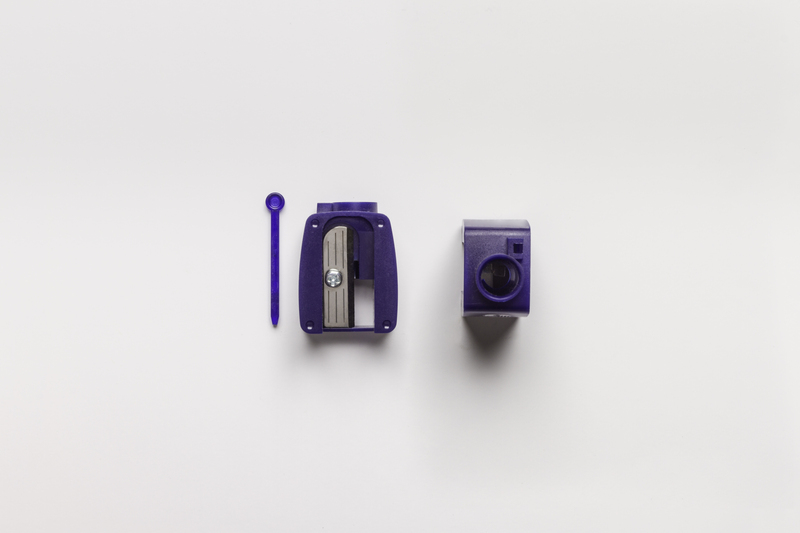 The Jakar Crank Desk Top Pencil Sharpener proved to be the most effective and the most versatile; unlike the other crank pencil sharpeners, it can be used with both regular and jumbo pencils. 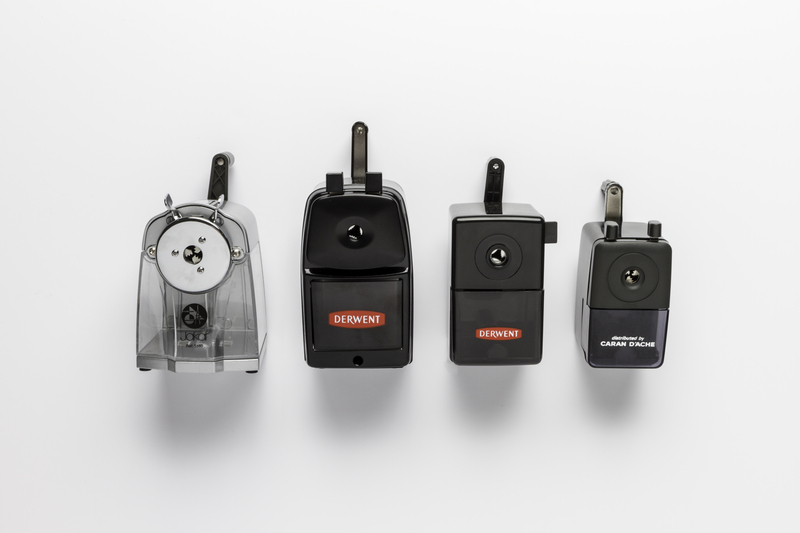 Jackson’s stock three types of electric pencil sharpeners. Two of these use regular blade sharpeners which revolve around the pencil, driven by a battery-powered motor. 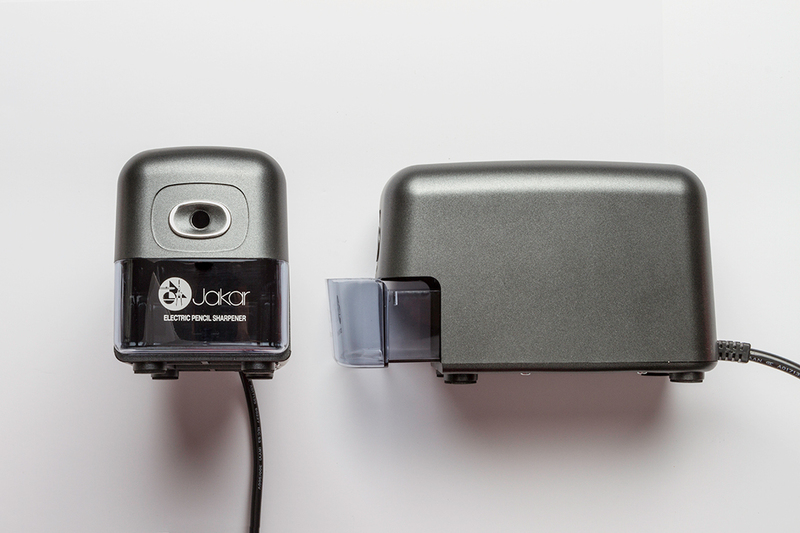 The most heavy-duty of our electric sharpeners, the Jakar Electric Pencil Sharpener with Auto-Stop, uses a helical crank mechanism. This sharpening mechanism is driven by an electric motor powered from the mains. This battery-operated double sharpener can be used with pencils of 6 – 8 or 9 – 12mm. It uses a couple of regular blade sharpeners which revolve around the pencil when it is inserted into either of the sharpening holes. These blade sharpeners are driven by a small electric motor. As inefficient as this sounds, it does actually produce reasonable results; it’s very easy just to insert your pencil into the sharpening hole for a couple of seconds every other minute. It would be a great choice for anyone who needs to sharpen their pencils near-constantly while drawing. It’s also great value. It takes four AA batteries. 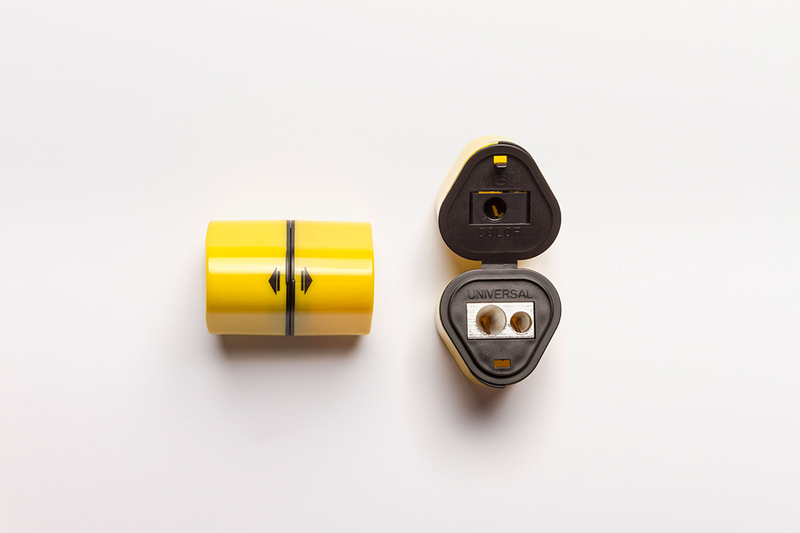 This Jakar Electric Sharpener has a UK wall-plug, which is attached to the device by a 1.6m long lead. The device will stop sharpening once the pencil has been brought to a fine point. With repeated use over a long time, the blade on this sharpener will wear down and become blunt. Replacement blades can be found here. This Jakar pencil sharpener has a single hole and a stylish ergonomic design. It has a reasonably small chamber for pencil shavings, but is otherwise very well designed. These tools are all sharpening implements, but with the exception of the Faber Castell Perfect Pencil, they are primarily designed for sharpening charcoal sticks, clutch pencil leads and pastels, rather than your average pencil. The one advantage sharpening knives and blocks have over conventional pencil sharpeners is that you can sharpen your lead into unusual shapes if you so choose. We didn’t think in this case it was very appropriate testing these tools against each other, as they’re designed for a wide range of different uses. 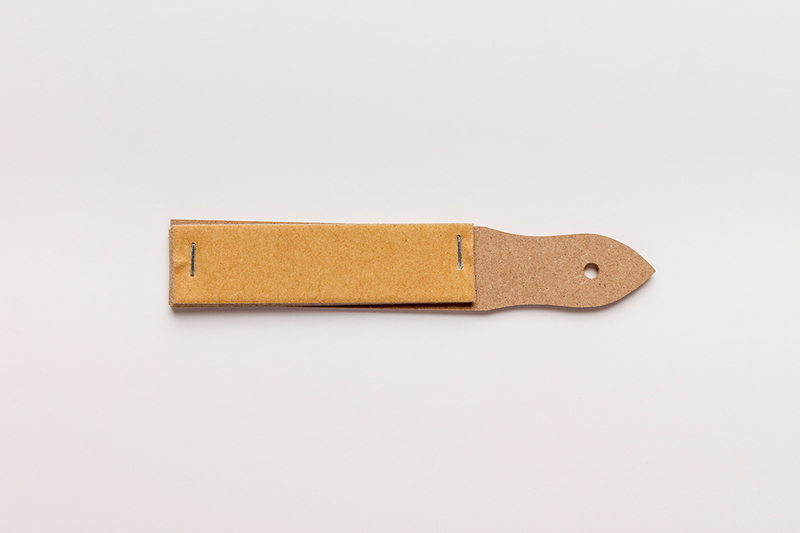 This Faber Castell Sandpaper Block consists of a block of wood with two strips of sandpaper mounted onto it. The papers are of different grades, fine and coarse, and are designed for sharpening fine lead points, charcoal sticks, soft pastels and pastel pencils, none of which sharpen well in conventional pencil sharpeners. A more economical option is the JAS Sand Paper Block, which works in the same way. This Faber Castell Sharpening Knife is best used with graphite sticks and hard pastels, but can also be used with pencils. You might need to sharpen it slightly if you are using it with pencils which have a thick wooden casing. It doubles up as an erasing tool. The Faber Castell Lead Pointer is a miniature blade sharpener for use with 2mm clutch pencil leads. It is extremely small and portable, and can be mounted on a keyring. In fact, if you don’t mount it on a keyring or something similar, I imagine it would be very easy to misplace. It’s far less practical than the Mars 502 Lead Pointer Tub pictured below. Staedtler Lead Pointer Tub is a rotary sharpener for 2mm clutch pencil leads. It can sharpen leads on their own or whilst they are mounted in a mechanical pencil and automatically stops when the pencil is sufficiently sharpened. It has two gauging holes: one will produce an extremely fine point for detailed drawing, and the other a standard point for writing. To use, place the lead of the clutch pencil in either of the gauging holes. These are the holes marked with a triangle, either side of the circular white cleaning pad. Press the end of the clutch pencil to release the lead into the gauging hole. 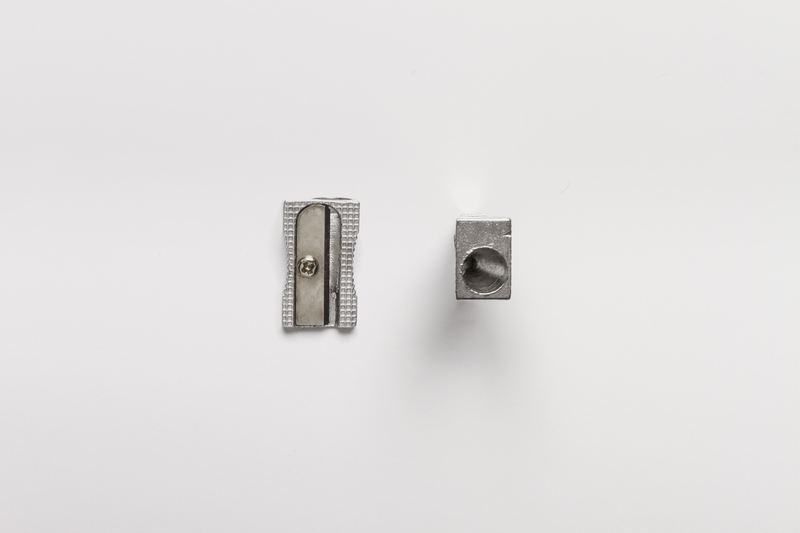 Let the clutch pencil clasp the lead again and lift the lead from the gauging hole. 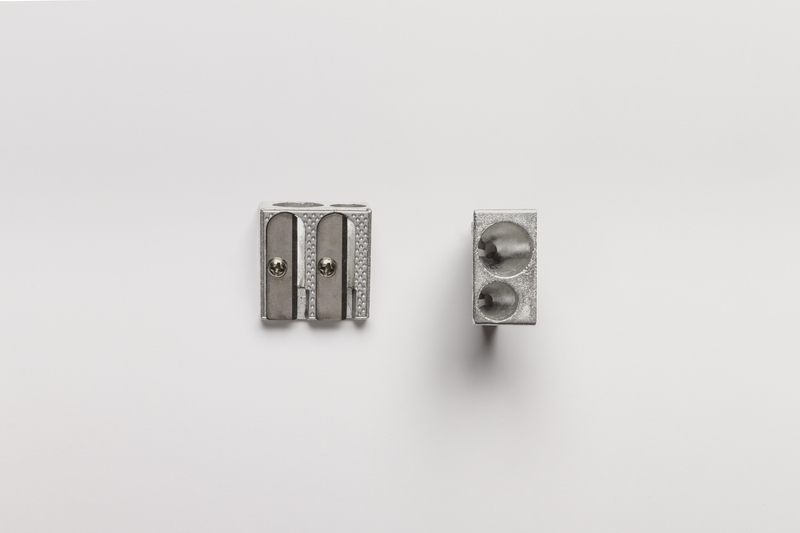 The lead will be protruding from the clasp, which will then ensure it is sharpened to either a moderate or a sharp point, depending on which gauging hole is used. Place the pencil in the large sharpening hole and spin the lid of the sharpener round (as if you were churning something inside the bucket) until it offers no resistance. At this point the lead will be fully sharp. Wipe the lead-dust from the point of the pencil using the cleaning pad and you’re done. This is a very effective and efficient sharpener. Unlike the Faber Lead Pointer, it catches the lead dust in a bucket and is therefore less messy. This neat little pencil comes with a plastic cap (with pocket clip) to protect its point, as well as an eraser and a tiny blade sharpener which pulls out of the cap. The Caran d’Ache Pencil Peeler is a great tool for sharpening your pencils, especially pastel pencils, which do not fare well in conventional pencil sharpeners because of their soft leads. This product works like a potato peeler; if you run the blade down the end of the pencil or crayon you wish to sharpen, a small curl of wood and lead will be pared away. It is possible to sharpen pencils with more precision than conventional pencil sharpeners, and to sharpen pencils to unusual shapes (to an extremely sharp point, to a flat tip, or to a stubby tip). The Caran d’Ache Pencil Peeler is quicker, safer and more accurate than using a craft knife. If you would prefer, the blade can be reversed so that you push it, rather than pull it, against the pencil. Simply bend the flexible metal frame apart so that the blade falls out, flip the blade round, and replace it in the same set of notches. This product comes with three replacement blades which can be inserted in the same way. Also available in a silver finish. This sharpening block is slightly smaller than a table-tennis bat. It is designed for use with charcoal sticks, hard pastels and soft pastels. 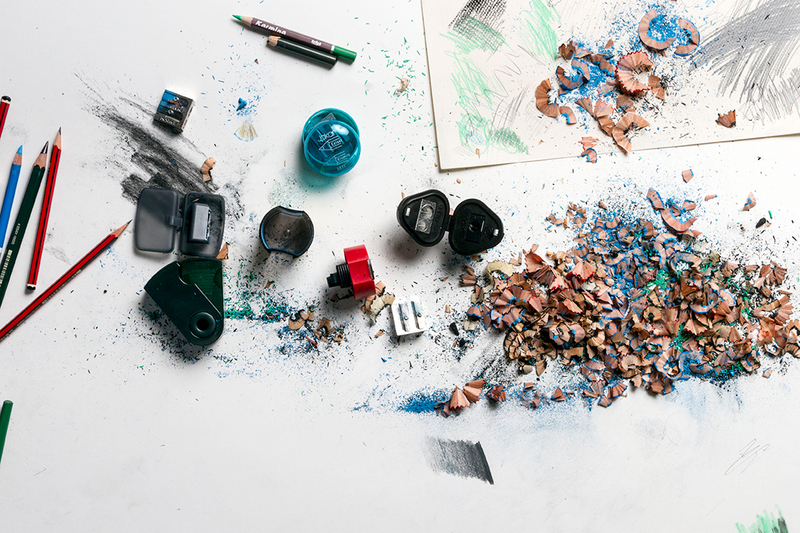 All of the sharpeners featured in this article are available from Jackson’s Art Supplies. Interested customers can view all of our pencil sharpeners and tools in our sharpener category. 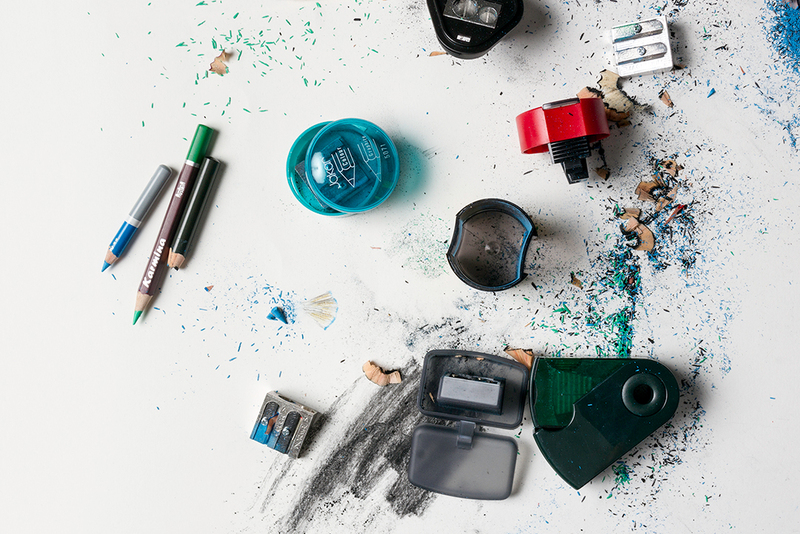 come to realize that nothing beats a manual pencil sharpener!